Painting your house, indoors and out? It's likely your wooden surfaces have become tired and dirtied over time, so why not treat them to a coat of wood paint? Painting woodwork is a quick and easy way to give a whole room a new lease of life, and it is one of the best actions you can take to brighten up your home. Read on for our pick of the best paint for wood. For more decorating advice, tips and guides, see our dedicated decorating hub page. A paint such as the top product, Dulux Trade Interior Pure Brilliant White Satinwood & Metal Paint, is ideal for skirting boards thanks to it being both durable and long lasting. However, if you’re looking to restore some furniture, you may be better off going for a water-based paint such as the Ronseal Chalky Furniture Paint. If you're painting garden furniture or garden fences, take a look at the Cuprinol Garden Shades Natural Stone Matt Wood Paint. And to give your garden shed a new lease of life and protection against the elements, consider purchasing the Cuprinol 5 Year Ducksback Silver Copse Matt Shed & Fence Treatment. Tough, durable and hard wearing, this paint from Dulux is perfect for interior woods, especially where there’s high volumes of traffic. Requiring just a couple of coats, this paint is easy to apply, with no undercoat necessary, unless the original colour is particularly bold. Thanks to its dirt resistance, it’s easy to keep doors and skirting boards looking clean and fresh. 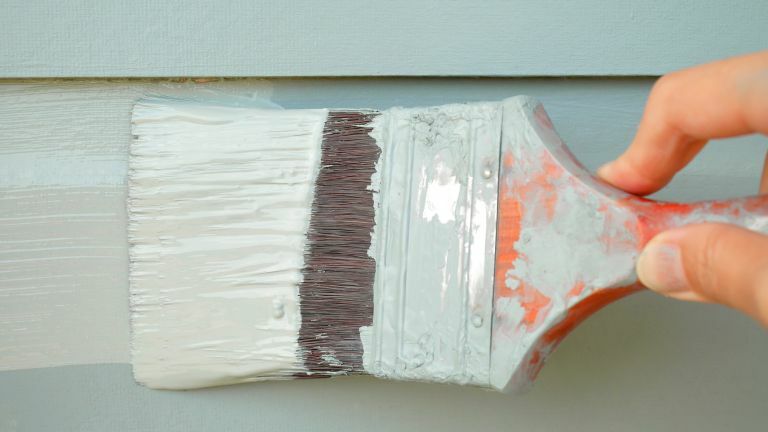 If your garden shed is looking tired and worn, you can give it a new lease of life with a coat of paint. Whether you choose to use a paint brush, roller or even a spray gun, this paint should provide your shed with a rich colour and long lasting protection. This paint is also perfect for fences and other wooden garden features such as benches and furniture, providing you with the option to keep your garden in sync. Exterior wood is put through its paces by the weather every day but you can make sure it remains in tip top condition by using this wood paint from Ronseal. The blend of ingredients allows for the natural movement of the wood, preventing cracking, peeling and blistering, while its weather resistance becomes active just one hour after painting. Suitable to paint on bare or previously treated wood, this Ronseal wood paint is a reliable choice for your garden. Whether it’s a summer storm or a hard winter front, your exterior wood should be protected with this paint from Cuprinol. It’s non drip, so don’t worry about the paint dripping on to your patio, and it protects your fence and decking from the damaging effects of rain and frost. It guarantees protection for five years and its water repellency is active an hour after painting. With 5 litres of paint at £10, you can’t really go wrong. Want more choice for exterior surfaces? Check out our best decking paint buys. Whether it’s a bookcase, a wardrobe or even a chest of drawers, if you’re looking to do something different with your home, sometimes painting furniture can do the job nicely. In addition to making your furniture look pretty, this chalk-based paint is tough, durable and drip-free, ensuring easy application and virtually non-existent maintenance thereafter. Available in a wide range of colours, you’re free to create the perfect look for your home. Want to more choice? Don't miss our best furniture paints.